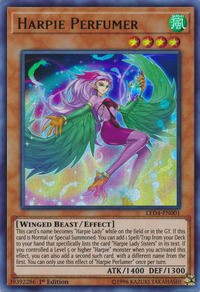 This card's name becomes “Harpie Lady” while on the field or in the GY. If this card is Normal or Special Summoned: You can add 1 Spell/Trap from your Deck to your hand that specifically lists the card “Harpie Lady Sisters” in its text. If you controlled a Level 5 or higher “Harpie” monster when you activated this effect, you can also add a second such card, with a different name from the first. You can only use this effect of “Harpie Perfumer” once per turn. This card is a reference to Mai Valentine's perfume tactics from Duelist Kingdom. This monster appears in the card artwork of Alluring Mirror Spirit. This card’s stats are the inverse stats of the original “Harpie Lady”.